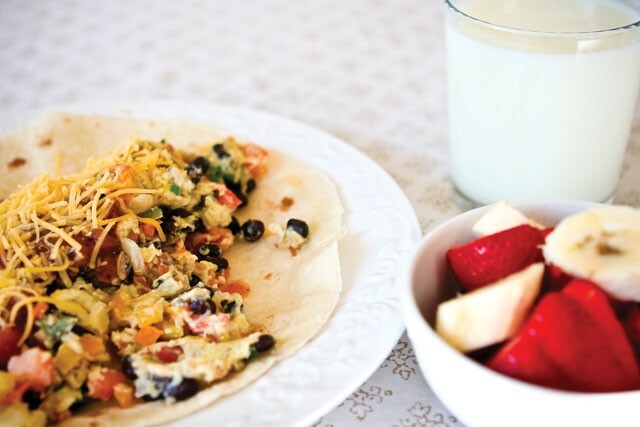 Spokane mom and Meatless Monday practitioner Michelle Sidles makes minus-the-meat look yummy with this breakfast burrito. “Really? Just one day a week?” Oprah asked incredulously. Meatless Mondays are hardly a new thing. The concept of food conservation to allow more food to be sent to the troops and residents of battered European nations during World War I is almost unimaginable now. The FDA came up with a slogan, “Food Will Win the War,” and initiated meatless Monday. During World War II, FDR revived the idea by encouraging housewives to support the war effort when meat was rationed. The current movement isn’t quite that old. “We launched way back in 2003,” says Chris Elam from the New York City headquarters of the movement’s flagship Website, meatlessmonday.com. “Back then it was primarily a public health initiative,” under the auspices of the Johns Hopkins’ Bloomberg School of Public Health, he continues. But with Oprah’s question, a convergence of factors — the bad economy, continuing news of global warming and the results of a huge, 10-year study published in the Archives of Internal Medicine that showed eating red meat every day increased the risk of death — things really took off. “The new Website was launched two months ago,” says Elam, “and we have had an amazing reception.” Since then the Huffington Post has initiated a weekly blog about Meatless Monday, Paul McCartney has been spreading the word in Europe, and Elam says the organization has been contacted by a number of countries around the world. Elam says part of the movement’s appeal is its simplicity. “We are ultimately a campaign of moderation. We’re not vegans, or extremists, or animal rights advocates.” Instead the goal is just for people “to help the planet and their own personal health.” And rather than focusing on what they’re giving up, Elam encourages people to consider the upside. “Healthwise, we are not only encouraging people to cut back on meats, but to boost up on fruits and vegetables and whole grains. Each week on the Website, we highlight a particular vegetable or fruit and go into the health benefits,” he says. Spokane photographer and mother Michelle Sidles says she grew up with meat at every meal. But last spring, she decided to give Meatless Mondays a try. The health benefits of a meatless Monday are significant — simply by cutting out meat one day a week, you’ve just reduced your meat consumption by 15 percent. Eating more beans, lentils, nuts and seeds will help reduce the risk of heart disease. Getting more fiber in the diet is almost unavoidable when meat is out. And since more fiber translates to feeling full sooner, some weight loss is often a pleasant side effect. But legumes are also nutritional powerhouses, loaded with protein, folate, zinc, iron and magnesium. The benefits to the environment are also substantial. The meat industry generates nearly 20 percent of man-made greenhouse gas emissions. Producing a pound of meat also consumes up to 10 times as much water as producing a pound of soy tofu. And meat production requires about 20 times as much fossil fuel as producing plant-based protein. The next phase of Meatless Monday will be to assist communities to implement the concept. “Schools and towns and groups and clubs and churches can create their own Meatless Monday,” says Elam. Already Woodcreek High School in Rosewood, Calif., has embraced the concept, and Ghent, Belgium, recently became the first city in the Western world to go meatless one day a week. Here’s a recipe from meatlessmonday.com. Heat the oil in a large heavy saucepan over medium high heat. Add the onions, carrot, potato and pumpkin and sauté for 5-10 minutes, stirring from time to time. When vegetables have softened, add the ginger and garlic. Continue to sauté for 2-3 minutes, then add the turmeric, coriander, cumin and cinnamon stick. Cook for another 5-8 minutes, then add the canned tomato and 1 cup of water. Bring to a simmer, season with salt and pepper, then add the raisins. Allow to cook for 18-25 minutes until all vegetables are soft, but don’t overcook. Just before serving, cut the preserved lemon into thin wedges and add as a garnish (this is optional but if you can locate it, the unique flavor of preserved lemon is worth trying). You can present this stew with some warm pita bread on the side, or serve it over a bed of couscous or rice pilaf. Want to add more interest to the dish? Try spiking the rice pilaf with some chopped apricots or slivered almonds. Visit meatlessmonday.com for more recipes.